Down Policing and Community Safety Partnership has rolled out its Summer Soccer Diversionary programme throughout Down district for six weeks. The summer intervention programme is targeting young people aged between 12 to 16 years old during the weekend to provide them with opportunities to meet new friends and learn new football skills. 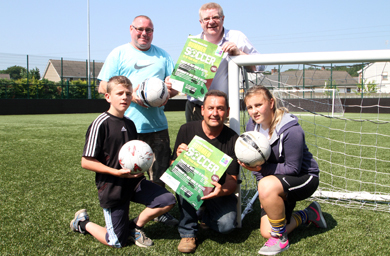 At the launch of the free summer soccer programme were, back row, John Ward of Castlewellan FC and Felix Blaney, Castlewellan Community Centre, with, front row, Ruairi Feenan, Councillor Willie Clarke, Down PCSP Chairmnan, and Nadine McAleenan. The programme which will target 100+ youths across the district will also benefit from educational workshops from local agencies such as ASCERT and PSNI. These agencies will educate young people on community safety issues such as personal safety and the effects of alcohol and drugs. Summer Soccer will also see youths across Down district benefit from expert tuition from Irish Football Association coaches in attendance at the evening football sessions. Chairman of Down Policing and Community Safety Partnership, Councillor Willie Clarke said: “During the summer months young people are at a loose end for something to do and this youth diversionary programme will give them a safe place to have fun and reduce the number of youths on the streets. For further information or to register contact Policing and Community Safety Partnership at Down District Council on 028 4461 0840. Please note places are limited.